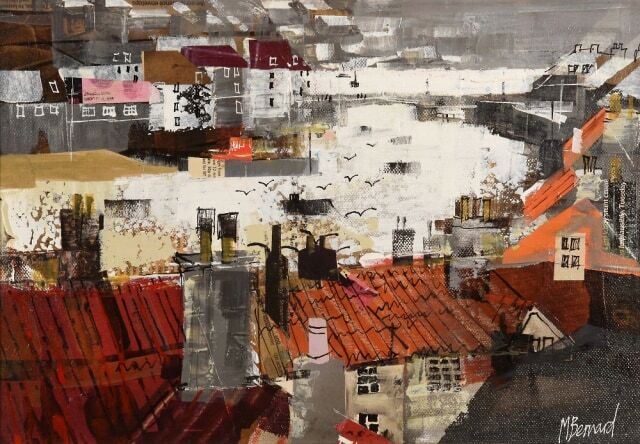 Born in 1957, Mike Bernard studied at West Surrey College of Art and Design in Farnham, followed by postgraduate studies at the Royal Academy Schools. Mike Bernard’s work has been shown at the Royal Festival Hall and he has exhibited widely in London and the provinces. He has won many awards including the Stowells Trophy, the Elizabeth Greenshields Fellowship, the Silver Longboat Award and the Laing Award. In 1999 at the R.I. Exhibition at the Mall Galleries he was awarded the Kingsmead Gallery Award. He was elected a member of the Royal Institute of Painters in Watercolour in 1997. His paintings portray a great sense of mystery, perhaps because he finds the painting of every picture an adventure and experimental journey through colour, shape and mark. He paints in almost any medium – acrylic, collage, pen and ink, watercolour or oil and often a combination of all these is used to achieve his end result. His unusual use of such adventurous techniques and mediums give spark, texture and life to his semi-abstract landscapes, seascapes, street scenes, still life and figurative compositions. ‘Collage has become an essential component of my work, the spontaneous and unpredictable results hopefully keep my work fresh’ he says. In great demand as a teacher he holds summer courses in landscape painting, both at home and abroad.